It takes about 20,000 compost worms (about 5 kgs) to recycle the waste from the average family of four. Worms can live for up to 15 years, and they have been on this earth for 120 million years. Every grain of healthy soil capable of growing food has gone through a worm�s gut. Human's very existence relies on worms doing their job in the soil. Worms have five hearts, no teeth, no eyes, and if you cut them in two - THEY DIE! It's an "urban myth" that worms survive as two worms when cut into two bits. Mature breeding Compost Worms can have babies every 1-2 weeks, laying 1-3 eggs at a go. A Worm is both a Boy AND a Girl - they are "synchronous hermaphrodites" which means they have both sets of sexual organs. But they do not self-fertilize - they still need another worm to have babies. And, they can fertilize another worm's egg even when they are pregnant. Every worm is both a Mummy and a Daddy! Each Compost Worm egg holds on average 5 babies, and as many as 12 babies, and these eggs hatch in 2-3 weeks. Compost Worm Babies mature in about 2-3 months. In theory, 1 kg of compost worms can turn into 1 tonne of Compost Worms in 1 year. Worm eggs can stay dormant in soil or compost for up to 15 years, waiting for conditions like moisture and food to be good enough to support their life. Worm eggs are often carried on the wind, in the soles of shoes and hooves of animals, and in other animal poop - that's how some kinds of worms came to New Zealand. Worms are found in every ecosystem on earth - They even live in the Ocean. 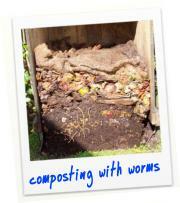 Compost Worms are more tolerate of yucky conditions, low pH, and eat all kinds of organic waste. Earthworms, in contrast, need near neutral pH to thrive, eat mostly soil and minerals, and have only one baby on average per year. Do you know another interesting fact you want to share with me? Email me.